"Ugh! This skirt is way too short, are you sure about this mikasa? Don&apos;t you feel uncomfortable.." You grumbled awkwardly tugging the short navy blue skirt down, whilst hugging your books to you chest. Mikasa glanced at you then forward again while the both of you strutted through the halls getting to class,"no, I&apos;m fine with it." She answered. You stared at her for a while,"hey mikasa, are you sure you want to wear that scarf? It&apos;s in the middle of summer, aren&apos;t you hot?" You asked, she shrugged and lifted the scarf closer to her mouth but I could tell she was smiling behind it,"I&apos;m used to it.." She muttered softly, I giggled in response and kept on walking. It had only been a few days since you moved back into the town, but you could tell that your long leave of five years that a lot had changed. You could see many new faces. I looked back down on my schedule,"hm.. French class? With Mr.Rivialle...?" I said mostly to myself, mikasa&apos;s eyes widened a fraction and she snatched the paper away from your hands. You stared at her curiously as she clicked her tongue and rolled her eyes crossing her arms over her chest. 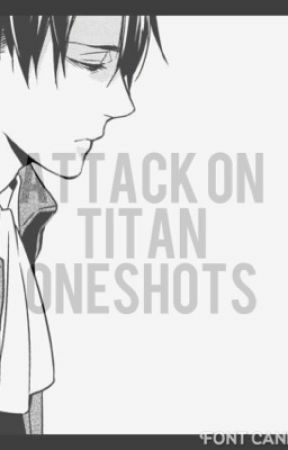 "Tch, that shorty, I swear if he does anything to you like he did with eren, I&apos;ll kill him." She narrowed her eyes. You slowly took the paper back and placed it back in your folder,"hm? Is Mr. Rivialle that bad?" I asked quizzically. She huffed and nodded,"that&apos;s not even his last name." She responded,"huh? Then what&apos;s his last name?" She shrugged in response,"all I know is that there&apos;s rumours going around that it&apos;s not his last name." She sighed and stopped at a door. "Anyway, we&apos;re here, eren has this class too, can you do me a favour and look out for him for me?" She asked, pink tainted your cheeks and you nodded. You had the smallest crush on the green eyed boy, though you often ignored it because you knew that mikasa had the same feelings for him, she would never say it out loud, but it was clear to everyone except him. I watched as mikasa strutted away, you sighed and averted your eyes clasping your hands on the metal door knob. &apos;Mr. Rivialle huh?&apos; You thought opening the door,&apos;I wonder what he&apos;ll be like.&apos;. I stepped into the classroom and saw eren, smiling brightly you took a empty seat next to him. 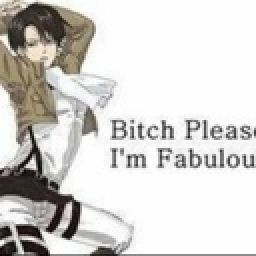 "Hey eren." I said, he turned his to me and grinned widely coming up and hugging me tightly,"e-eren, y-you saw me t-this week end." I choked out, he released his tight hold his bright green eyes just as mesmerising. "Ah yeah, I didn&apos;t expect you to be in my class y/n." He responded shyly scratching the back of his nape. I giggled when I saw his tinted cheeks. He sat back down when he heard the door slam open and a short man with a midnight black hair and piercing steel eyes stepped in wearing a casual suit. Saying he was attractive was an understatement, your breath hitched in your throat at the mere sight of him, you could tell from the corner of your eye that many of the girl thought the same of the man. He wrote on the white board, his neat curvy writing,"my name is levi rivialle, but you brats will call me Mr. Rivialle, understood?" He said eying the students, his gaze lingered in your area for a whole before he snapped his head back to his desk and took out text books. Slamming the thick books on each desk, i felt my cheeks heat up at the slightest when he slammed the text book in front of me staring at me for a little whole before turning back to his desk. "These brats-" he said while holding up one of the thick text books that said in cursive letters French,"are your text books for the years, DO NOT, break them, ruin them, dirty them." He said holding up three slender fingers,"if you do-" he narrowed his eyes,"I will break you." He said darkly, it brought shivers down everyone&apos;s spine, everyone quickly nodded and gulped. He clicked his tongue and turned on his heel back to the board and continued on with the French class. I drowned him out and just continued to stare at him up and down, I will admit he had a very good body just to he a teacher. I had slowly started to drift off, my eyes feeling heavy... Darkness consuming me. Till a loud bang on my desk, I jolted up immediately, I looked up to see the a dark gaze glaring at me intensely. His eye twitched,"are you sleeping in my class?.." He said lowly and darkly, my eyes widened and I gulped my hands becoming clammy,"u-uhm... I-I-I&apos;m... R-really sorry!" I yelled squeezing my eyes shut, he clicked his tongue. "Detention after school brat!" He yelled and strutted back to the bored, I could feel eyes burning holes at the back of my head. I sighed and leaned my head on my desk hiding my blushing face in my arms. I felt a small poke on my side which made a small giggle,"heh y/n are you okay?" I heard eren whisper, I nodded my head smiling underneath my arms. I swallowed thickly as I slowly opened the door to French class. I peered in too see the desk where Mr. Rivialle sat. I gingerly stepped in and sat down on the desk. He looked up from his paper work and narrowed his steel eyes at me. "So, do you think you can sleep in class and get away with it miss. l/n?" He said smirking slyly, leaning back in his chair crossing his arms over his broad chest. You blushed immensely being able to see his broad chest more clearly through his thin layers of clothes. "N-no Mr. Rivialle! I apologise dearly sir!" He hummed in response, you stared at him as he ran his hands through his dark strands of hair. "Tell me y/n, are you seeing anyone." He smirked leaning his head on his hands, your eyes widened as your blush deepened. "E-excuse me sir?" You asked again thinking you mis-heard. "What are you deaf? I asked you if your seeing anyone, answer the damn question brat." He spoke roughly. You nodded quickly and gripped the hem of your short skirt tightly,"n-no sir! I-I am not currently seeing anyone." You squeezed your eyes tightly. "Open your eyes brat you look like an idiot." He snarled, you slowly opened your eyes to see the man smirking an un noticeable faint red on his cheeks. "I see, what about you and that jaegar brat, you two seem to he close, do you like him?" He asked, you blushed deeply once again,"n-no sir! M-me and e-eren do not have that k-kind of r-relationship!" You said stumbling over your words horribly. He nodded looking slightly pleased,"I see.. Well then, your times up miss. y/n. You may leave." He sounded bored, you quickly stood up and briskly walked out the door clutching your top were the heard was heaving heavy breaths. 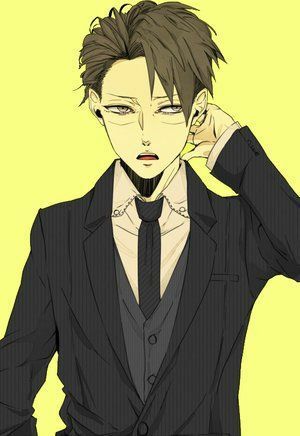 Levi sighed sweat trickling down his forehead, gripping his hair tightly leaning his head against the white board. Heavy puffs slipping from his mouth. &apos;Damn it was so hard to control myself... Why does it feel like my heart is clenching?&apos; He thought to himself trying so hard to suppress heavy urges.